A few months into the new era in Redmond under CEO Satya Nadella, Microsoft's board could be gearing up for some serious conflict. The Hewlett-Packard example might not be so funny now. Bill Gates appeared on the "Charlie Rose Show" two weeks before Satya Nadella was named CEO of Microsoft. Rose tried unsuccessfully to corner Gates into saying something about the executive search. The veteran host failed to trap his cagey guest, but the two did end up sharing a laugh. Talking about HP's famous CEO succession troubles, Rose said, "I was trying to think about Hewlett-Packard, whether that worked?" Gates replied, "Oh my God," as both men laughed. You'll recall that a lot of HP's troubles stemmed from boardroom dysfunction. A few months into the new era in Redmond, Microsoft's board could itself be gearing up for some serious conflict. For a long time, Microsoft was well-known for having a go-along board that was willing to be led around by Gates. When a member wasn't so willing, Gates reportedly had a gift for beating back any challenges with a one-two punch of intimidation and unparalleled technical depth. That iron control has seemed less apparent in recent years, but he was still the founder and the chairman. Now he's not the chairman and his shares are (by his own design) dwindling. His special status advising Nadella could help him still pull the strings -- should he choose to do so. The official tale, provided by Ballmer and new Chairman John W. Thompson to The Wall Street Journal, was suspicious. (Short version: Ballmer decided it was time to retire as CEO based on a series of personal reflections and family talks.) Now comes the more plausible (but anonymously sourced) Bloomberg BusinessWeek account of Ballmer and the board in a screaming match over buying Nokia. By that account, Ballmer got his way, but then was ousted. 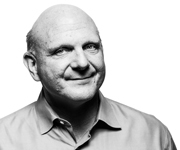 On the board, Ballmer has some turf and legacy to protect. One question is how long Ballmer will stay on the board. In an interview with The Wall Street Journal, Ballmer basically said he wasn’t sure. Will the former Symantec CEO try to establish his authority over Gates, Ballmer or Nadella? If so, how will that go? Same question as Thompson gets. What happens when Nadella asserts himself in a disagreement with Gates or Ballmer? The 38-year-old president of ValueAct Capital is a major wild card in this equation. He's an activist investor, but (hat tip to Todd Bishop at GeekWire) he's also on record saying in effect: "You catch more flies with honey than vinegar." All these people could gel. Or...maybe they won't. How do you think it will work out? Tell me in the comments below, or drop me a line at sbekker@rcpmag.com.